Nope. Spend city resources on maintaining city roads and sidewalks for vehicles, cyclists (on the road) and pedestrians. Not on a bike path through a park. Alternatively, you could buy a bigger/better bike to handle the snow. If we don't do things because the money could be spent doing other things, we'll be a city that knows the price of everything and the value of nothing. It shouldn't be a "maintain city roads and sidewalks" or "maintain bike paths through parks" choice. We should do both. The war on cars is over, remember? Toronto doesn't care about cyclists! Haha... I wondered if someone would mention that Rob Ford quote. The thing about Marie Curtis is that the Etobicoke Creek runs through the middle of it, that means the eastern half is in Toronto and the western half is in Mississauga. None of it is maintained in the winter. 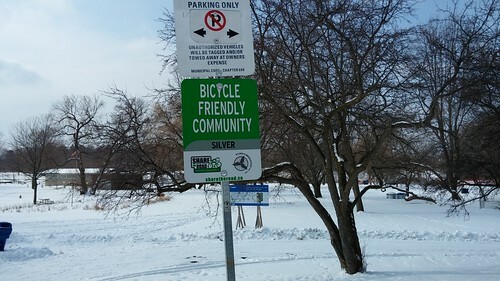 And one more point... if you're not going to maintain the path in the winter, that's fine... but don't stick up a shiny new "Bicycle Friendly Community" sign just to rub that fact in our faces! "If we don't do things because the money could be spent doing other things, we'll be a city that knows the price of everything and the value of nothing." You were just waiting for an opportunity to use that one. That logic/argument could be stretched to include a lot of unnecessary services - heated swimming pools in the winter for example. I'm sorry, I can normally see your point of view on things, but this is a bit ridiculous. But let's use your logic - there is ZERO value to this city to having the city's bike lanes in parks cleared of snow. In fact, there is less than ZERO value. By taking on the responsibility of clearing the snow AND ice of bike lanes in parks, the city is taking on the liability of YOU injurying yourself by taking your bike on these paths in the winter. What happens if it isn't cleared properly and you fall off your bike? Can you sue the city? Also, there is the damage to the grass that is caused when one puts salt on the paths, AND, the damage that is caused when a mechanical snow clearing machine is used. 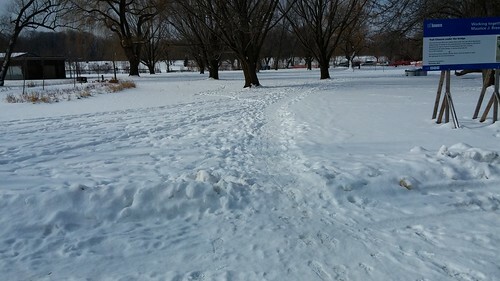 In fact, it's better for the path that it's not cleared because the snow acts as a barrier against the thaw/freeze/thaw which causes pot holes. Also, that layer of snow in your picture is better for pedestrians because they are less likely to slip in snow then on a cleared path which may have frozen over with ice. Honestly, since about a week before Christmas until about a week ago, it was a sheet of ice. You couldn't walk on it let alone bike on it, no matter what bike tires you had. Then don't walk on it! It's nature! If this problem causes you stress, then you're pretty lucky. No stress until they put up that damn sign! Mike, the Finch Corridor bike trail is fantastic, but in the winter it is just like your photo. In the summer, Toronto Hydro spends money cutting the field (they think its a lawn) but no maintenance at all in the winter. It would be a drop in the bucket to contract this winter maintenance out for them but like everything else, it has to be cost effective, which means, Forget about it.